Mumbai, murder and a baby elephant….. Inspector Ashwin Chopra is due to retire this very day from the Mumbai police department so he’s not expecting to have any more cases to solve before he goes. But then two mysteries fall right into his lap – luckily not literarily as one of them is a baby elephant. The first mystery however is a drowned little boy whose death is suspicious and who no one seems bothered to solve. But Chopra is not having any of it, and last day or not, he’s going to get to the bottom of it. So he trawls the city of Mumbai looking for clues – with a baby elephant named Ganesh as his sidekick.. There is a slum which runs alongside this road. Auto-rickshaws buzzed through the dusty urban maze…. This is the Mumbai of Inspector Chopra. A soon to be retired inspector with a baby elephant as a sidekick? Only in India and perfect for India! 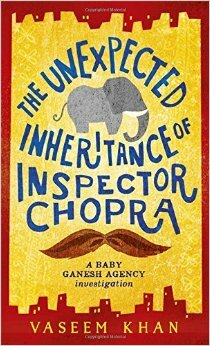 As Chopra trawls the city looking for clues into the murder of a man, it’s the elephant which takes centre stage. At first Chopra doesn’t really know what to do with an elephant. What use can it be to him? Why would he want one? But Ganesh has a way of endearing himself to Chopra and before long, this is one duo that is as unique as the colourful Mumbai setting. The more serious of the mysteries is about a dead man – Santosh Achrekar – and a promise made to Santosh’s mum makes him trawl the streets of the city from the city slums to the teeming town centre. The overall investigation deals with a multitude of evils which pervade the chaotic, messy and noisy underworld of India. Well what can I say. The setting, the characters and the way in which they jump off the page – ‘the gaggle of sweating citizenry’ , or ‘Mumbai’s pavementless streets’ is just a joy to read. Chopra is an intriguing character – often melancholy and what the poor man has to put up with on his last day at work! He sniffs his food as a ritual since he has an aversion to ginger – it’s these little quirks that made me picture the man as if he was stood right beside me. The hot humid streets make you grateful that this book is such a page turner as they provided a welcome breeze as the action ramped up and the ‘bovine press of bodies’ continued to squash the words together. It was that realistic I swear I had to wipe my brow on more than one occasion or prepare to hold my nose when Ganesh appeared on the page. Aah Ganesh. I do love you. You make the world a better place. Chopra loves his city of Mumbai and now he has you. If you ever want a holiday though – the door of booktrail towers is always open. And there’s as much straw and elephant food as you want.